This is very useful because it utilizes the asmdeactivationoutcome attribute of grid disks to determine if it’s safe for a cell to be upgraded. This attribute tells cellsrv whether a disk can be safely taken offline. If the ASM redundancy is degraded (whether due to a failed disk or a cell being patched), cellsrv will know to not take the disks offline. Rolling patching via patchmgr will only apply patches to cells sequentially. If you have a large enough cluster, you could potentially be able to take multiple cells offline at once – it’s all up to the partner disk configuration for ASM. What if we want to apply an update? Purpose: Performs an action or alter attributes for a software update. attribute_name:  attribute to be changed. VALIDATE PREREQ: Download software and run checks. UPGRADE: Download software, run prereq and upgrade. FORCE: Ignore prereq failure on upgrade. It’s important to note that the “store” attribute is not a URL to download that patch itself. Instead, it is a directory that can be browsed. This way, one URL can be used every time – if you put a new patch version in the directory, cells will automatically update based on the schedule and polling frequency. Also, you cannot use the file name as it comes from MOS (p###_version_platform.zip). What you need is version#_patch.zip. It is worth noting that this functionality was introduced in 18.1.0.0.0, which means that you have to be on this patch level to use this feature. It won’t be able to be tested until a new patch beyond 18.1.0.0.0 is out. Thankfully for us, Oracle released version 18.1.0.0.0 during Open World, and we now have an 18.1.1.0.0.0 with the October quarterly full stack patch. I went ahead and upgraded one of the Exadata racks in the Enkitec lab, and now we can test the 18.1.1.0.0 upgrade with this new process. drwxr-xr-x 2 4294967294 4294967294 6 Oct 27 14:21 .
drwxr-xr-x 7 4294967294 4294967294 7 Oct 24 14:11 ..
enkx4cel05: Software Update successfully altered. enkx4cel06: Software Update successfully altered. enkx4cel07: Software Update successfully altered. enkx4cel05: Software update is scheduled to begin at: 2017-10-30T22:45:00-05:00.
enkx4cel06: Software update is scheduled to begin at: 2017-10-30T22:45:00-05:00.
enkx4cel07: Software update is scheduled to begin at: 2017-10-30T22:45:00-05:00. As you can see, 2 of the cells are ready to go, and enkx4cel07 is still running its prerequisite check. They are ready to update at 22:45 on Monday night, as I instructed them. During this initial phase, the patch files are downloaded to /var/swupdate/. If there are any issues with the prerequisite checks, you can find the logs in /var/swupdate//logs. There will be a file named .log that contains the output of the checks. This rack is running a virtualized configuration – I currently have all of my clusters shut down, meaning that when the storage servers wake up to apply their patch, they should all be upgraded at once. This is due to the asmdeactivationoutcome attribute showing “Yes” for all griddisks. If my cluster were online, one of the the cells would elect to go first, beating the other 2. They will wait for the first cell to upgrade. When its griddisks are all back online and synced up, the race condition will begin again and repeat until all cells are patched. enkx4cel05: Software update is scheduled to begin at: 2017-10-31T09:20:00-05:00.
enkx4cel06: Software update is scheduled to begin at: 2017-10-31T09:20:00-05:00.
enkx4cel07: Software update is scheduled to begin at: 2017-10-31T09:20:00-05:00. [2017-10-31 09:24:07 -0500][INFO][0-0][patchmgr][patchmgr_print_format_message] Working: Wait for cell to reboot and come online. Between 35 minutes and 600 minutes. [2017-10-31 09:24:07 -0500][INFO][0-0][patchmgr][patchmgr_print_format_message] enkx4cel06 will now reboot for software update. All terminal sessions will be closed. [2017-10-31 10:39:05 -0500][INFO][0-0][patchmgr][patchmgr_print_format_message] enkx4cel05 will now reboot for software update. All terminal sessions will be closed. [2017-10-31 10:40:35 -0500][ERROR][0-0][patchmgr][patchmgr_print_format_message] FAILED: Wait for cell to reboot and come online. [2017-10-31 10:40:35 -0500][ERROR][0-0][patchmgr][patchmgr_print_format_message] Patch failed. Please run cleanup before retrying. We cannot connect to enkx4cel06 (it’s currently being patched), and the other cells show a status of “Running” – they’re actually waiting for the active cell to complete. As soon as that cell’s disks are back online, the remaining cells restart the race and continue moving along until every cell is finished. One feature that I would like to see is an email alert that opens when a storage server begins patching and a “cleared” message when it is complete. With the current process, updates are completed silently. What will happen to a cell if the rolling patch fails? Cell patches could fail for any number of reasons – firmware upgrade issues, disk failures, or if the “timeLimitInMinutes” attribute is exceeded. In that case, administrators will receive an email alert (determined by the smtpToAddr attribute for the cell) saying that the patch has failed. alertMessage:           "The software update for 18.1.1.0.0.171018 failed." alertAction:            "Correct the problems shown in the attached log files, and then run:  ALTER SOFTWAREUPDATE UPGRADE   and verify that these problems are fixed. Diagnostic package is attached. It is also accessible at https://enkx4cel07.enkitec.local/diagpack/download?name=enkx4cel07_2017_10_31T09_50_16_493_1.tar.bz2 It will be retained on the storage server for 28 days, after which it may be automatically purged by MS during accelerated space reclamation. Diagnostic packages for critical alerts can be downloaded and/or re-created at https://enkx4cel07.enkitec.local/diagpack"
The option you take will depend on what caused the failure on your side. If you need to wait for another slow period to restart the upgrade, you are better off setting the schedule attribute and letting the cells proceed on their own. Overall, while I am a creature of habit, I can definitely see the benefits of this change. 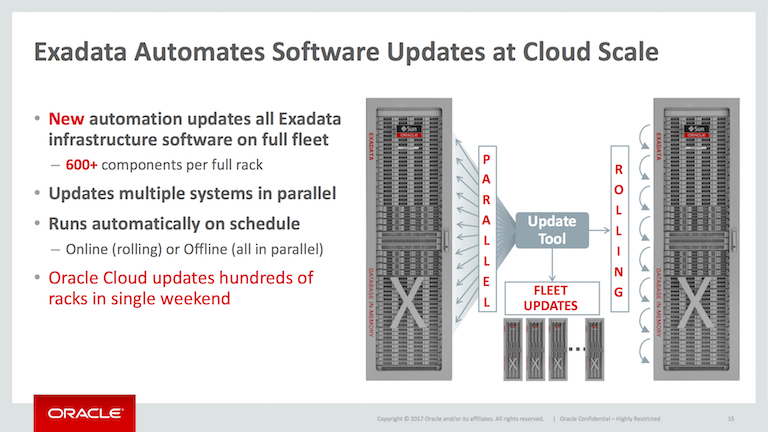 While many customers running smaller eighth/quarter rack configurations may continue to use patchmgr, this will be a welcome change for larger Exadata environments. I’m also very happy to see this utilize the existing underlying technologies rather than trying to reinvent the wheel with the patching process. I asked about the email to development and they said that when upgrading large number of systems, the operators did not want an email alert for success but just on failures to keep the inbox tidy. That makes sense. It would be nice to have a flag to turn that on or off, but I definitely understand why. One of the great things about storage server alerts is that they aren’t overly chatty.